Criteria for choosing the right mandibular Orthotic. Hyperactivity and obstructive sleep disorders in children. Nuts and bolts of tongue tie. Enlargement of the superior maxilla. Contribution of orofacial myofunctional therapy in an orthognathic surgery team. Sleep-disordered-breathing in children and myofunctional therapy. Airway-kening orthodontics & myofunctional therapy working together to improve/save lives. Developing an ideal arch form in orthodontics. Buteyko Method: Practical Workshop for Sleep Disorders & Myofunctional Therapy. Prevention and Treatment of Sleep Disorders with Myofunctional Therapy. Pierre-Jean Monteyrol The new surgical techniques of OSAS. (structure du XII) & Right positioning of the nose during sleep and facial growth. Changes in Nasal Airway by Non-surgical Midfacial Expansion. Relationship Between Ankyloglossia, Anatomical and Functional Alterations and Body Posture. Orthodontic treatment and Myofunctional therapy in children with residual OSA after adenotonsillectomy. 09h30 – Patricia Franco: Children’s sleep: its peculiarities. 10h15 – Mathieu Laurentjoye: Maxillary growth. 13h45 – Thierry Gouzland: Contribution of orofacial myofunctional therapy in an orthognathic surgery team. 14h15 – Stéphanie Bioulac: Hyperactivity and obstructive sleep disorders in children. 16h25 – Eyal Botzer: Nuts and bolts of tongue tie. 17h25 – Joy Lea Moeller: Prevention and Treatment of Sleep Disorders with Myofunctional Therapy. 08h30 – Isabelle Bonafé: Criteria for choosing the right mandibular Orthotic. 09h15 – Maria Pia Villa: Orthodontic treatment and Myofunctional therapy in children with residual OSA after adenotonsillectomy. 10h30 – Derek Mahony: Developing an ideal arch form in orthodontics. 11h20 – Francois Darqué: Enlargement of the superior maxilla. 13h30 – Giovanni Olivi: Relationship Between Ankyloglossia, Anatomical and Functional Alterations and Body Posture. 14h20 – Pierre-Jean Monteyrol: The influence of the nose in facial growth. 15h30 – Won Moon: Changes in Nasal Airway by Non-surgical Midfacial Expansion. 16h20 – Patrick McKeown: Buteyko Method: Practical Workshop for Sleep Disorders & Myofunctional Therapy. 17h00 – Panel Discussion: ALL SPEAKERS Chaired by Pierre Jean Monteyrol and Marc Moeller: Critical Trends in Interdisciplinary Care of OSA. 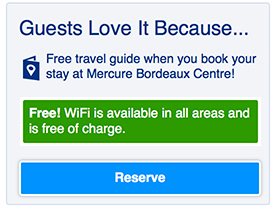 The Mercure Bordeaux Centre is located in the heart of Mériadeck, the city’s business district. It offers modern facilities and is just a short walk from the historic center of town. Guest rooms at the Mercure are air-conditioned. They include a private bathroom, Wi-Fi and flat-screen TV with international channels. Rooms are accessible by elevator. Buffet breakfast is served daily. There is also a contemporary bar and restaurant. Mériadeck tram stop (served by Line A) is a 2-minute walk from the hotel. There is a public parking lot nearby. Hotel de Ville is a 5-minute walk away. Bordeaux City-Centre is a great choice for travelers interested in Shopping, Food and Great for Wine. Join us for some VIP tours of the best Vineyards Terroirs such as Rothchild and Saint-Émilion. From romantic getaways to family fun, there is always the right way for you to Discover France.